With the first few games of the shortened NHL season in the books, what can we say we have learned about the 2013 version of the Buffalo Sabres? The Sabres got out to a great start with wins over Philadelphia and Toronto before losing their both games of a home-and-home series to Carolina. While it may not be much to break down and evaluate, here are some positives and negatives the Sabres have shown so far. After their huge offensive output in the season opener, the trio of Thomas Vanek, Cody Hodgson and Jason Pomminville continue to lead the way in the early going for the Sabres. After the first four games, they are the team’s top point-getters with Vanek at nine (three goals, six assists), Pomminville next with eight (three goals and five assists), and Hodgson third with three goals. 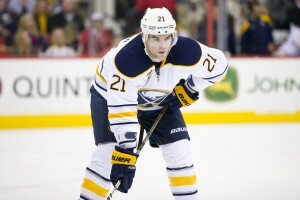 The positives are that Vanek has shown early that he can be a dominant player in the league. He has the skill, the speed and is not afraid to go to the net. Hodgson is fitting in nicely as a top-line centre. He too is showing no fear of getting in front of the net. Where he needs to improve is in the faceoff dot for high-pressure face offs. There were too many late face offs in the Toronto game that were won by the Maple Leafs. Pomminville continues to show consistency from game-to-game. While the top line has been on fire to start the season, depth scoring has been an issue. No other forward, other than the top three, have multiple points. More concerning, is the lack of production from the second line of Tyler Ennis, Drew Stafford and Marcus Foligno, who have combined for two points through the first four games. The Sabres special teams units have been hot, but also cold. The power-play unit showed how good they can be in the Flyers game with three power-play goals. 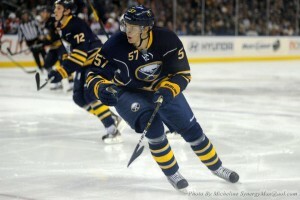 It was also encouraging to see Steve Ott and Tyler Myers scored on the man-advantage, taking pressure off the big guns. The penalty kill showed flashes of brilliance in the game against Toronto, killing off four penalties in the opening period including a pair of five-on-three advantages. One of the big contributors, leading forwards in short-handed ice time, was Jochen Hecht. The 35-year-old veteran has embraced his new role as a penalty-kill specialist and as a mentor to Mikhail Grigorenko on the third line. The negative is that they have given a few too many power-power play opportunities to their opponents and they have seen too many of their best penalty killers spend time in the box. Myers has taken four minors already and Vanek has three including one in the final two minutes of their second game with Carolina while down 2-1. Buffalo gave up four penalties to Philadelphia and Carolina, in both games against the Hurricanes, and seven to Toronto. In addition, they did give up a short-handed goal in the first loss to Carolina. Probably the thing that has Sabres fans most excited is the increased physical play and toughness. They have shown they are not afraid to drop the gloves in defense of a teammate. In the game against the Flyers, Ennis took a hard hit from Scott Hartnell and it was Stafford who came to stick up for his teammate. It showed that it doesn’t have to be a tough guy who answers the call, all of the players will stick up for one another. John Scott and Foligno also both dropped the gloves against Toronto and Ott fought Tim Gleason against Carolina (in Buffalo). It is not only the fights, overall the Sabres have shown they are a tougher team to play against, especially in their own zone. Their defense has established themselves as a physical force. One area of concern is the notion of a guy like Stafford fighting Hartnell. Luckily he was not hurt. The last thing the team needs is for one of their top-six forwards, who they need to produce points, to injure himself in a fight. Looking back at the special teams play, they say your best penalty killer is your goaltender and that has been very true for the Sabres. Early in this season Miller has shown he is in fine form. 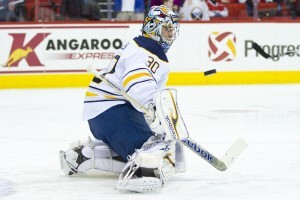 Miller had two great starts to begin the season including a dominant performance against Toronto. Miller essentially stole this game and the only goal the Leafs did get on him was on a power play, with their goalie pulled. Miller turned aside 34 of 35 shots faced. Miler was also steady against the Flyers making 27 saves on 29 shots and 39 against the Hurricanes in his only loss.Jonas Enroth made his first start against Carolina (in Carolina) and allowed six goals on 38 shots. He admitted after the game that he was disappointed in his performance. He has not won in his past 12 starts. His last win came Nov. 28, 2011. 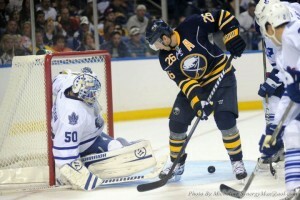 There is no doubt that Enroth has to get going. Miller showed signs of fatigue near the end of the Toronto game meaning the Sabres will get solid outings from him but to expect him to play every night is unrealistic. These are just some of the things the Sabres have shown so far this year. However, it is only four games into the campaign and this is but a glimpse into the big picture of the season. However, there have definitely been more positives than negatives. If the Sabres can correct their early season issues, like depth scoring, staying out of the box and getting Enroth playing at his best, there is no reason to think this team can’t be successful, earn a playoff spot and maybe even do some damage. But there are still many more opponents and games to be played.